Hi All! I hope you've got a sweet tooth because this card just may be cavity worthy :) This card was incredibly fun to make with its soft pretty colors and lots of layers- courtesy of the sketch at Friday Sketchers this week. I used the new CC Designs Swiss Pixie Cupcake Birgitta digi that you can grab here and I tried a new technique with my Spellbinders die by fussy cutting around her legs and then pulling them outside of the die before sending it through my Big Shot. It was actually incredibly easy and I love how it turned out, especially since the she seems to be sitting in the image. 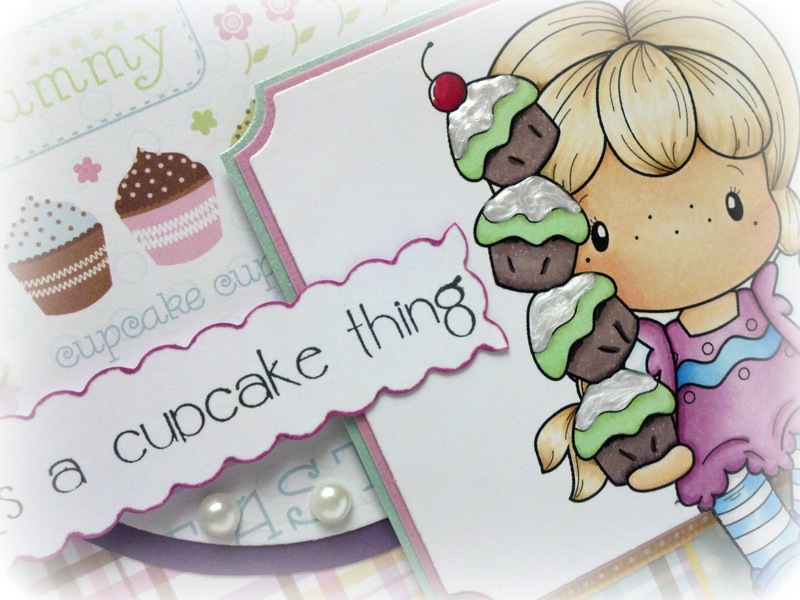 Now I just have to make sure that this card ends up in the hands of someone who seriously loves cupcakes! Love your card, very pretty. Isn't she the cutest thing? And your card is, too! So glad you linked up at Craft Us Crazy! This is beautiful! Simply stunning! She is adorable!! Thanks for playing with us att Craft Us Crazy!